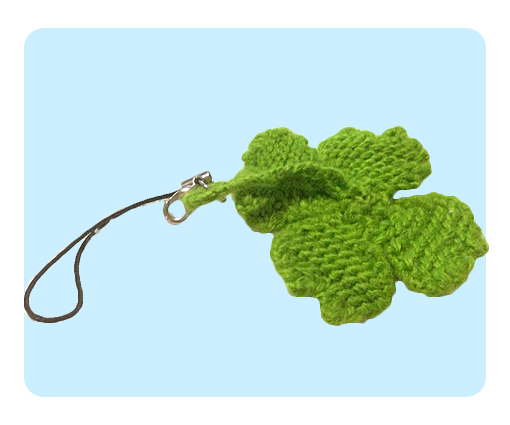 Last year someone from work told me that my birthday is just a day before St. Patrick Day, then my cousin requested that I knitted a leaf for her. Well after racking my brains out it just suddenly clicked — I thought why not do four leaf clover? I did my research and found that St Patrick’s only has three leaf, but I like four as it’s symbolizes luckiness. 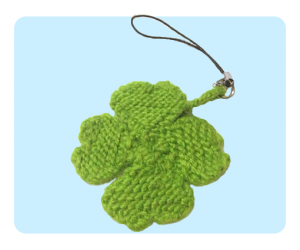 The pattern is very easy to adjust, simply knit one less leaf if you prefer three leaf clover! These days I am using a lot of short rows in my knitting, this time also no exception. 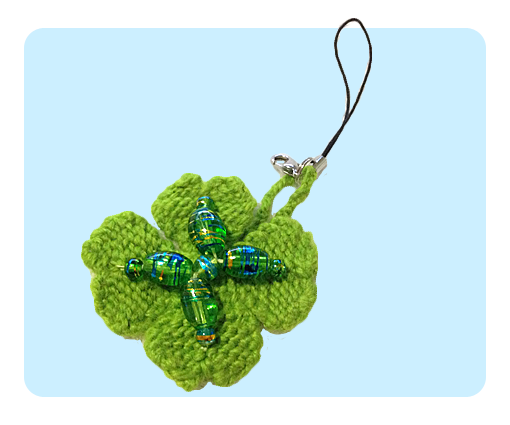 I used short rows to shape the leaf on the top. Also in this pattern, there is no need to wrap the yarn before turning as we won’t have any holes in the finished product. 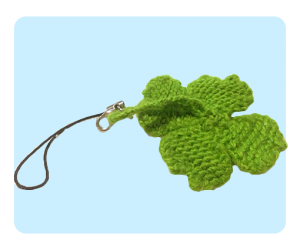 I knit this in one go so there is no need for seaming at the end, if you find it too difficult you can always knit the 4 leafs separately then join them together at the end. 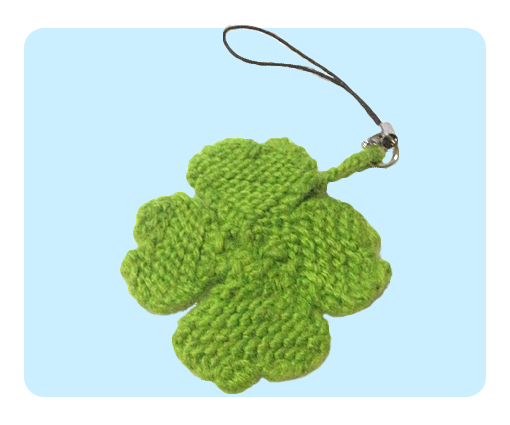 I made the four leaf clover into mobile phone charm, you can also make it into a keychain, or if you prefer you can just have it by itself as ornaments. 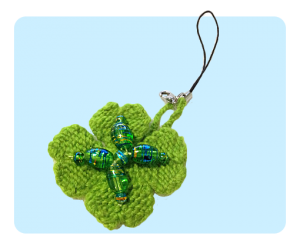 On top of the leaves, I sew some glass beads in various sizes. When I was designing it, I really wanted to add green and gold beads to give it that extra spark. I will show you what they look like, with and without beads. Which do you prefer? Short Rows: Rows that are only partially worked before turning. *Option*: Or you can just cut off your yarn and leave approx 15cm and seam the leaves together at the end. Once again, pull through the yarn, then bring it back down to the middle and then all the way down to the bottom so it’s next to your CO tail. You have successfully completed your first leaf! Make three more by using the connecting yarn and start by casting on again. When you have finished all four leaves, position all your leaves together then use your needle to secure the middle area so they no longer move around. weave in the remaining yarn. Using the long CO tail earlier, CO 1 and keep Knitting until you reach the length you desired. Then BO, and fold into two to make loop. If you are making a keychain / mobile phone keychain, attach it now before you secure the loop together. free knitting patterns, intermediate knitting patterns, knitted leaf, straight needles. Bookmark. Thanks for this pattern. I knit and sell items in aid of our local hospice so am always glad of new ideas. I hope you don’t mind me picking your brains. Many thanks and good luck. On some of the Recipe sites I visit, they have the option of “Large Print”, which makes it soooo very much easier to read the recipes that I am printing out…Wish your site had the same option, as I can barely SEE the pattern, once it is printed out…and, since I have Cataracts in both eyes, this IS a matter of importance…to ME, that is! And I’m sure that there are a number of other elderly knitters who would really find that option a beneficial one! By the way…LOVE YOUR PATTERN!! First of all, Merry Christmas to you too :)!! Thank you for your comments and I am very happy that you like my pattern. The button is located on the bottom of the page, right above your comments. There is this section called: “Sharing is Caring”, and on the far right there is this print button (It has a printer icon with green coloured paper) called “Print with PrintFriendly”. If you click on that it will open up a new page, and in this page you can select bigger text size.